Aion is based on antagonistic relations between the demons and angels, between "The Chosen" and "The Fallen". The core of the Aion universe is Atrea, a world who's fractured in two. On the surface, like a giant shell, lies Elyos, the world of angels while on the interior of the sphere lies the Abyss, who's inhabitants are still unknown, except their name: Asmondiands. The only link between the two worlds is the Tower of Eternity. The story is based on his quest to discover his identity, what that battle meant and why the final blow of the battle was too much for him, leaving no memories. As you progress through the game, you will transform into a demon. Your "lair" will be into Abyss, and you will be able to teleport between the real world and the Abyss. You will be able to take quests from both realms as each realm has its own life. Finishing quests will give you experience, leading you to the possibility to buy skills. There will be a lot of skills available but at this stage of development not many have been implemented. One quest was impressive though. At level 10, you will be able to fly. Unfortunately, this happens only for a short period of time so you must plan your landing in advance. Failing to reach the land in that time will lead to hurting your character in some degree or even death if the fall is too much for him. 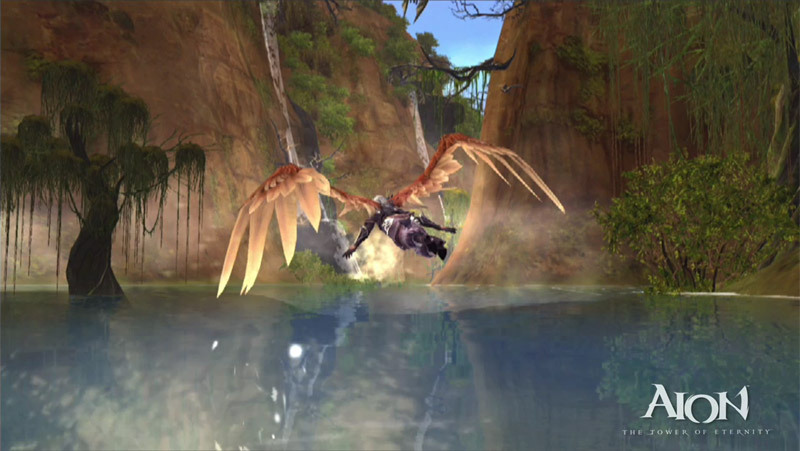 Aion features two playable races, the Elyos and the Asmodians. Both races have the same origin, which explains the fact that they are not that different in their appearance. The most distinctive differences are the skin color and the wings. While many player refer to the two races as "Good" and "Evil" respectively, the developers explicitly pointed out that they can not be categorized as simply good or evil, but that their motives are much more complex. The Elyos live in the lower half of the world and receive the majority of the sunlight. Subsequently their world is bright, colorful and filled with green plants, lush green woods and tropical beaches. The sun also influenced their appearance. 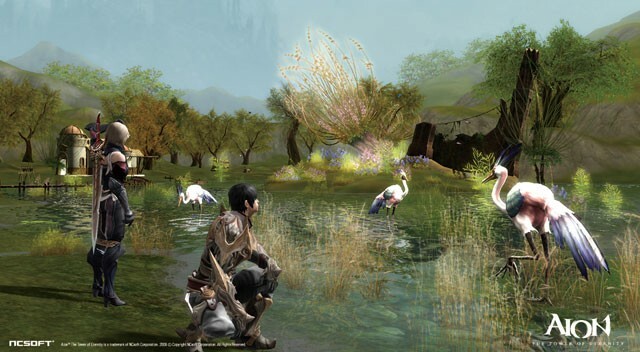 The Elyos are very much like humans with light skin and no extraordinary characteristics. The Asmodians inhabit the upper half of the world and receive only a fraction of the sunlight. Subsequently their world is rather dark. Blue and dark green dominates the colour palette, while the flora is dominated by exotic plants that can deal with the little light they get. The lack of sun also influenced their appearance over time. They developed a darker skin in blue tones and grew claws on both hands and feet. The Balaur are NPCs and cannot be chosen at the character creation screen. They have artificial free will, and are designed to be unpredictable when they appear, for example, they may side with you during a skirmish with the opposing faction, but afterward they may decide to turn on you.